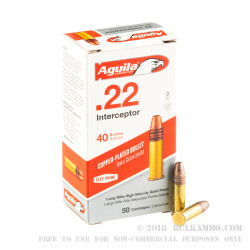 This 22 LR cartridge by Aguila sports a 40 grain projectile, the original and standard bullet weight for its caliber. 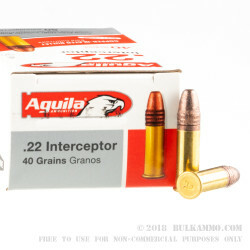 In spite of that, this round delivers a positively blistering 1,470 fps muzzle velocity which Aguila claims is the fastest of any comparable 22 LR cartridge on the market. 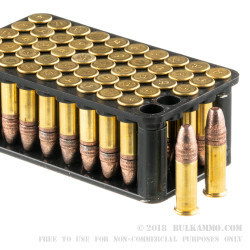 With such speed this cartridge’s trajectory is flat as a board, giving its shooter the great accuracy needed for satisfying plinking, competitive shooting, and effective varmint hunting alike. 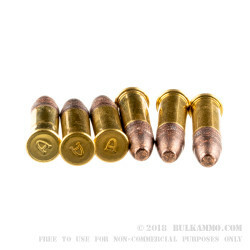 This round’s bullet is a solid point, but its impressive energy downrange more than makes up for its inability to expand if you’d use it for hunting. It is also copper plated, so you’ll be able to fire more of them before bore fouling necessitates a good cleaning. Aguila thoroughly tests and inspects their rimfire products components before letting them leave their factory, and their clean burning propellant is gentle on the firearms that get to ignite it.